Biker Garden Gnomes seem to have become quite popular recently. Perhaps out of a bit of an urge to imagine gnomes in a different way? It’s all very well thinking of rude, funny, zombie or football gnomes, but there is another way. Traditional they have red caps, blue shirts, britches and wellies. But some manufacturers have been seeing gnomes in a very different light. They think of them as free spirits, riding to live and living to ride. In other words, they have created a whole world of biker gnomes! Motorcycle garden gnomes, leathers, helmet, harley – the whole 9 yards. You need to act like a bat out of hell and look through my collection of biker gnomes uk right now! PS – My collection is Biker Garden Gnomes in the UK. PS You can see the ultimate biker gnome, The Gnominator, on another page on the site by clicking here. The old garden favourite, Woodland Wilf, turns his hand to motorcycling for this very bright and endearing motorcycle garden ornament. This intricately detailed garden gnome statue is modelled with Wilf riding his Harley style motorbike through the gardens and woodlands, the wind in his hair as he enjoys the freedom to ride wherever he wants. His bike is a vivid shade of green to resemble some garden plants and Wilf himself is beautifully dressed in leathers that have a green tinge to them, a green lid and his luxuriant white beard. Made from weather resistant polyresin, these guys are intricately handpainted using UV stabilised inks which will ensure that they look great for a long time when placed outside, even in direct sunlight. He is about 17.5 cm in height and when it turns dark, his headlight glows from an LED which is charged from a solar strip strayegically placed on his rear mudguard. One other thing to note is that Wilf comes with foam pads underneath which will protect your tables and shelves if you decide to buy him as an indoor ornament. This is a massive seller and as I write this post, there have been 138 reviews of this gnome with a collective rating of 4.8 out of five which is a fantastic endorsement of this product. Reviewers love him and many started off buying him as a present but ended up buying some for themselves! Many commented on how well crafted it is and fully recommend it to friends and family. This motorcycle gnome makes a great gift for friends and family who are gnome enthusiasts, bikers or both. And he costs a very reasonable amount of money. As well as the gnome, you also get a Collector’s Booklet in the box. Once you get biker Wilf and see just how good he is, you’ll be looking to the whole of the collection! Click below to get a Woodland Wilf of your own. This guy is bad to the bone, a genuine class Gnome Biker with attitude. He has an Ink Slinger skull tattoo, shades, black leather cut off waistcoat and a black gnome crumpled lid (or helmet as straight folk call them). He hits the road on his bright red Harley, bottle in hand, livin’ life on his own terms and answering to no one. He is cast in a quality designer resin and hand painted to a very high standard. Only hand painting could show off the flames on his fuel tank to their full glory and the tombstone tail light. He measures about 13.5 inches wide x 5.5 inches deep x 11 inches tall and weighs about 3 lbs. Would make a great gift, especially for the petrolhead type gardener! Click below to get him today at a great price. This Motorbike Gnome Ornament is the very image of Summer Cool. 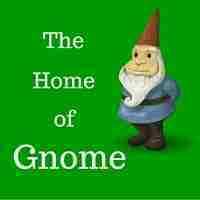 Gone are the wellies, britches and tunic which are so familiar in the traditional garden gnome. Dressed very casually in shorts, with his shirt wide open, sunglasses on and nothing on his feet, the only gnome remnants are his beard and red cap. He reclines on his red Harley Davidson and raises a cool bottle of beer in a salute. He measures about 21cm x 20cm x 8cm and would make a great gift for any garden lover, biker or garden loving biker! Click below to get him. If you are looking for a biker gnome to brighten up your garden, this is it! This very charming garden fountain is made from weatherproof polyresin and made to represent a very cheeky looking gnome riding a motorbike. He is handpainted in great detail and features a LED which will delightfully light up your garden after it gets dark. When you switch it on, this Gnome Water Fountain trickles water out of the exhaust pipes which is collected in a reservoir and circulated so it never needs replacing unless it evaporates in the sun. The tranquil sound of the trickling water is really relaxing as you enjoy your garden. It is mains powered and has a UK 3 pin plug with a 10m cable. This should give you plenty of options to place it in your garden and yet still plug it in in the house or garage. He measures about 66.5cm long x 34.2cm wide x 59.5cm high so he is a substantial garden ornament. But delightful pieces of this size and quality don’t come cheap. Be prepared to pay for him but you will love him. Click below to find out the current price. I’m not sure this really cute garden ornament qualifies as a biker as he seems to be riding a pushbike made of wood. However, the collection is biker garden gnomes and he is definitely a biker, just not the motorcycling type. Not dressed in traditonal colours of red, this little guy sports a very fashionable mix of green trousers, paler green tunic and green/mustard coloured hat. He does, however, have the black wellies, white bushy beard and big smile. He seems such a happy chap and is probably very pleased that his transport is very green and environmentally friendly. He’s doing no damage to the ozone layer. He measures approximately 21cm tall and is so cute, could be used outdoors in the garden or indoors as an indoor ornament. And he comes at a great price, well under a tenner! Click below to get one today. This cute special garden gnome would make a great present for all motorbike fans. He was born to ride his green bike everywhere, looking really cool in his bike and green cap. Decorative and funny, he is bound to bring a smile to all you visiting friends and family. Measuring about 21cm, this guy is a brightly coloured, high quality modern gnome for all gardens but can equally be used as an indoor ornament. Rockin his motorbike, he rides his bright blue bike while wearing his yellow pants, black boots, red coat and bright green pointy hat. Click below to check out the latest price but it won’t be high. If you are looking for a cute lady garden gnome, then you need to look no further than this lovely garden ornament which depicts a girl gnome on a bike whic is also a planter. She is a high quality garden ornament, made of natural resin and measuring approx 25cm x 13.6cm x 26.9cm, which is a good size for a gnome. She is wearing a green smock dress and an orange cap ( which is not really very traditional in gnome terms) and she rides a wooden bike with a large front wheel. At the back are two small wheels upon which sits a wooden plantpot, suitable for your favourite flower. She is really cute and would make a great present for a gardening enthusiast. She costs a very reasonable ££. This guy looks the part of the biker but he’s clearly parked his bike and his making his way to the bar, he has such a determined look on his face! The traditional white bushy beard is the only gnome characteristic that remains. Gone is the red cap and tunic. He wears a black leather bikers jacket, a black leather cap on his head, black shades and high black boots. The only thing not black about him is his blue jeans which seem to be visible from the top of his boots. Made of cold cast ceramic, he is about 8.75 inches high x 4.5 inches x 3.25 inches so he is quite a small garden gnome. But he carries a lot of realistic details to compensate for his small stature. All in all he really looks the part and would add a touch of character to any garden. ** Update 14 Aug 16 – I’m sorry but this great guy seems to popping in and out of availability and may not be available to buy just now. Freel free to give it a try, though. This is the last one in my biker collection and there isn’t a lot of information about him. Traditional gnome styling, he wears a red cap and has a white bushy beard. Yellow t-shirt, blue jeans and leather waistcoat mark him out as a bit different. As do the shades and the bright red motorcycle he rides. Below him is a piece of green grass he’s riding on. This piece is very robust and durable, produced to a high standard and hand painted with colourfast and lightfast paint so he won’t fade. Each piece is individually made to a set of unique designs. Not many people will have this motorcycle garden ornament, so if you’re looking to be a bit different, click below to get him for your garden or a gardener. ** Update 14 Aug 16 – This great biker gnome seems to be unavailable quite a lot lately, I’m sorry. If you love him, though, still click below to give him a try. I hope you enjoyed my collection of biker garden gnomes. If you weren’t looking for a biker, you can also see my collection of large garden gnomes and solar garden gnomes.